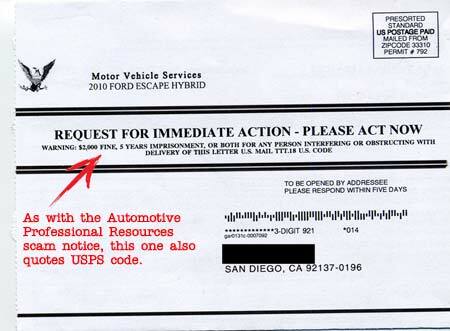 Three months after receiving an ‘expiring warranty’ mailer from Automotive Professional Services, here comes another one. It looks nearly identical to the previous mailer, only with a few edits: the name in the upper left hand corner and a different toll free phone number (800-639-9440 listed on the previous mailer; 855-292-6947 on this one). Oh, and apparently this is my FINAL NOTICE. We’ll see. So, naturally, I had to give the fake ‘Motor Vehicle Services’ a call. Unlike with Automotive Professional Services, I got a customer service representative with a calmer mien. ‘Brian’ informed me that I was calling an “activation center” called “Guardian.” When I asked if they were affiliated with Guardian Insurance, he seemed just a tad nonplussed. In fact, he never gave me the FULL name of the company he worked for, which, after a search, must be American Guardian Warranty Services, Inc. (not to be confused with Guardian Products, a furniture and mattress warranty company). According to Brian, Guardian serves as a “broker” for many different automotive warranty companies, depending upon where the vehicle and its owner is located. Then I asked about ‘Motor Vehicle Services’ in the upper left corner of the mailer. Brian told me that this is merely a “division” within the activation company. Hah! So, then would ‘Automotive Professional Services’ be a division of the ‘activation’ company who sent me the previous mailer? When I posited this to Brian, he shifted quickly into telemarketer script mode and asked, “So, are you interested in buying an extended warranty?” To which I replied, “Nope. I already have one. But at least you calmly answered my questions.” Then he mumbled something about my “having a nice day” and abruptly hung up. So, since I couldn’t get any more information from Brian about the call center boiler room he’s working in, and left with the only name I could find linked to this operation, I focused on American Guardian Warranty Services. I found no glowing endorsements of the company or the services it provides. A simple Google search reveals a whole lot of OMG dating back to 2005. Perusing a page on ComplaintWire.org from 2011 – 2012 shows how AGWS’s PR team must scour the internets looking for bad publicity, then posts an ‘official’ (and hopefully placating) statement about how they pride themselves on their integrity yadda yadda yadda. Then, of course, there’s the post immediately beneath it by a ‘happy’ AGWS customer, wagging a virtual finger at all the naysayers. They probably hire people via crowdsourcing companies, paying them pennies to defend the company’s ‘honor’ against negative posts. The bottom line: Always, ALWAYS check your vehicle warranty records when you receive these mailers or phone calls. 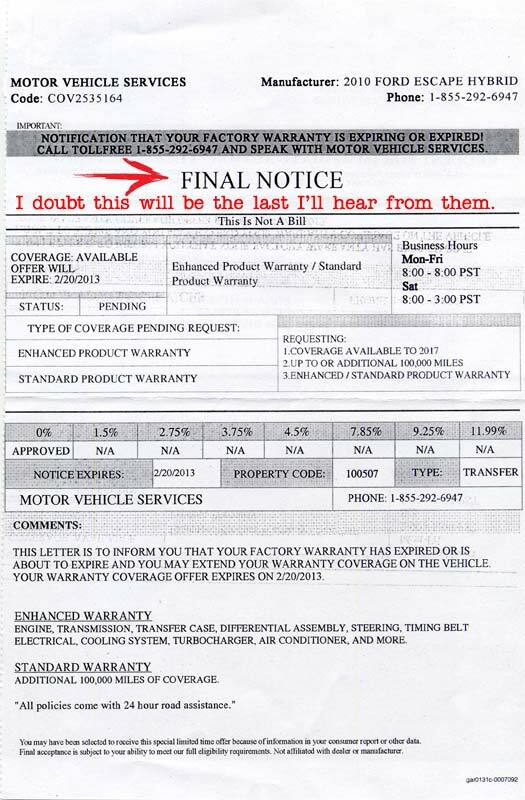 If you must purchase (or renew) an extended warranty, err on the side of caution and visit your dealer first. Or call several vehicle warranty companies and THOROUGHLY research their plans. If you have grill them, do it; if they want your business, they’ll have to WORK for it and be HONEST about what they’re offering you for YOUR money. Personally, I would never trust any company sending me mailers attempting to scare the crap out of me in a falsely “official” way. Those are the tactics of a scam artist, whether or not the product or service itself is a scam. Period. 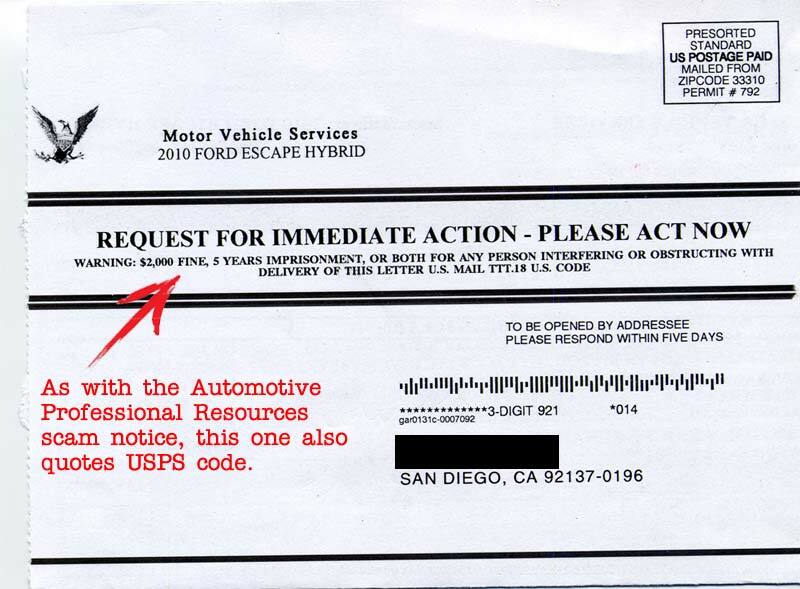 UPDATE (April 2014) : More recent information regarding Motor Vehicle Services and their questionable marketing practices can be found here. Today is July 2, 2015 and I just got scammed by the same company. This time the rep’s name was “Eric” and when I called back 10 minutes later to cancel services, his name changed to “Brain.” When I asked “Brian” to speak with “Eric” he told me that “Eric” was out of the office and that he could leave a message for me…even though I recognized his voice as the same person all the while. He then continued to take the time out of his day to harass me for 5 minutes on the phone about why I wanted to cancel my services before I hung up on him. If you are reading this, don’t stress, call up your bank and cancel your card and then go in and get a new one. Then file a dispute for all cleared transactions. You WILL get all your money back. Lesson learned: some people are pathetic and make a living being violent and deceitful to others, its a shame that “Brian” or “Eric” or whoever couldn’t apply himself more in life and actually make a positive difference in the world. Oh well. Good advice. It’s a shame that we’re forced to inconvenience ourselves by resorting to the drastic tactic of cancelling a credit card in order to stop these goons from taking more of our money. We have to keep spreading the word about these scammers. And worst, the telemarketing services and their harassing minions. Grr! Telemarketing bottom feeders and their bottom-feeding clients. TWO strikes against them. I get called by these people at least once every couple of months. Is there anything I can do to either get them to stop calling me, or better yet, to put them out of business? Most recently I got a phone number from them: 800-264-2714. I’m just not sure how to even go about reporting them or who I would report them to. Unfortunately, other than reporting the flyers to the USPS mail fraud department and reporting the telemarketing phone numbers to the FCC’s Do Not Call Registry, it’s difficult to stop these flyers and calls from coming. Mainly, these scumbags just keep changing their names and website URLs. Total rip off I just found out protectmycar.com changed name a number of times and they don’t pay claims. Protectmycar.com. total scam!!! Ripp off they don’t pay any claims.make you jump thru hoops and never pay.they just steal money from you every month. What a nightmare, Protectmycar.com is a waste, I should have researched it more.i had to cancel my card and report for fraud as they didn’t do as stated.what a waste of time.call your bank and charge back it’s the only way to get your money back. I received 3 calls from 7206398002 this week, stating they are from the “Warrenty Activation Department”. Today, I received a call from Mandy about my car warranty expiring. I quickly noticed Mandy was an IVR (interactive voice response) – not a real person. She hung up on me even though I tried responding. I see a lot of various posts on this number in the past week so I assume they really blowing people up. Yep, these scumbags are resorting to every trick available to them. Hmm, using an IVR — that’s what the IRS scammers are doing. I guess the extended warranty bunch are somehow related. Fraudsters sticking together. How nice. Grrr. If you’re that stupid to buy an extended warranty, especially outside the dealer or manufacturer, you deserve what you get. That’s exactly what these scumbags are counting on. Caveat emptor. I received the same maiilout. I refused to give up my banking information and hung up. The agent that answered was rude and my question is how did these deadbeats get information on my purchase? Unfortunately they are able to obtain this information courtesy of your state’s DMV. Yes, exactly. Moved to a new state and the week after changing tags, we started receiving these flyers in the mail. Strange how they continue without any fines, etc. Try to get the most information and copies of their letters and papers. I unfortunately fell for this scam last Thursday. Same guy, Brian, insuring me that all will be fine with my vehicle using the diamond plan since my car is old. Talked to one of their so called “reps” named Jackson. Kept begging them how to cancel the policy and they just kept looping me around in a circle. They hung up once I called them out for being scammers. Thank goodness I was able to go to my bank’s branch manager and get them to cancel the transaction and give me a new card. I really detest these people.